A Finance Director has admitted that she embezzled £77,000 from her employers over a two year period. Petronella MacDougall, 59, used her position at the top of the finance section to take tens of thousands at a time out of her firm’s business account. MacDougall was employed by A-Line Audio Visual, an Aberdeen-based firm who provide audio-visual event production and support, and AV sales and hire. According to reports, MacDougall used some of the cash to pay for a deposit on a horse box along with other extravagancies in a lifestyle that contributed to her undoing. Her activities were noticed by fellow directors Richard Trilk and Andrew Dunn when suppliers weren’t paid. In all, MacDougall admitted to taking £77,162.24 from January 1 2011 to February 26 2013. 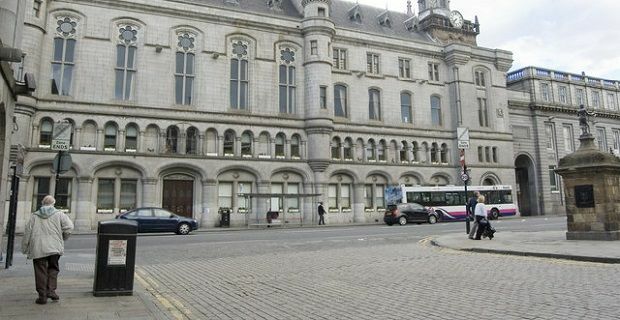 She has recently appeared at Aberdeen Sheriff Court, shown in our lead image, to face charges. Sheriff Graham Buchanan has deferred sentencing and granted MacDougall bail at this time. This sort of theft isn’t very common anymore because of the stringent policies firms put in place and the stringent checks that auditors carry out each year, so we were surprised to read that so much money could be taken over such a long period of time. The typical sentence for this type of crime could include time in jail. The fact that MacDougall took advantage of a position of trust means that this sort of offence is frowned on by the courts. If her actions have caused financial difficulties for the firm or had any negative effect on her employees, then there’s more chance that she’ll be handed a custodial sentence. She could also face a fine, be placed on probation, or ordered to do community service. Whether she’ll ever work in a finance section again must also be in doubt.